COMMENTARY ON "OUT OF THE WHIRLWIND"
In Job chapter thirty-eight God is ready to reveal himself to Job in the form of a series of questions. Just prior to this, in chapters thirty-two through thirty-seven, Elihu the son of Barachel the Buzite of the family of Ram confronted Job because Job had justified himself instead of God, Job 32: 1-3. However, Elihu was also upset with Job's three other friends because they had condemned Job without just cause. In all of Elihu's defense of God as absolutely sovereign he does not resort to justifying God's justice. Nor, as we shall see as we study further, does God defend his justice either. Instead, God begins by asking one simple question of Job; “Where were you when I laid the foundation of the earth? Tell me, if you have understanding". All that God then says to Job is a restating of this one foundational question. Job could not answer God nor can anyone else. What we learn is that there is none who can challenge the justice of God. Therefore any belief that Satan has challenged God's justice is a lie and a fraud from the mind of Satan himself, John 8:44. In the outcome of what happens to Job we are not even informed how Satan reacted to his defeat. Instead, we are left with the understanding that Job's spiritual growth is what God had in mind from the very beginning. Remember it is God who challenged Satan, Job 1:8-12, not the other way around. "It’s one thing to believe intellectually in the nearness of God to us; it’s quite another to experience that nearness. How can you learn to draw close to God and to derive hope and comfort from this relationship?" For Job the sudden appearance of God out of the whirlwind is an epiphany. Sudden perhaps but with Elihu's just completed discourse upon the sovereign attributes of our Creator God we should not assume it was totally unexpected by Job. In any case, this is not an example of how we should learn to draw near to God. Rather, this is a comforting example of the action of our loving and holy sovereign God reaching out personally to Job. It is God who initiates, directs and develops this encounter with Job. Instead of speculating on how "suddenly and unexpectedly, the Lord now appears" to Job, we should be examining what God has to say to Job and then understand how and why Job then responds to God. "What was the first question that God asked Job, and what was implied in that question? Job 38:2." "If Job expected some detailed explanation about why all these calamities happened to him, he didn’t get it. Instead, what he got was a flow of rhetorical questions contrasting the Lord in His creative might to the transience and ignorance of poor Job." The lesson seems to forget that God is the one who is asking the questions, not Job. It is the lesson author's assumption that this would be an appropriate time for God to explain to Job 'the why of things' yet doesn't. Of course the issue here is that the lesson author's real agenda is to promote and attempt to defend the Great Controversy Doctrine which is founded upon the false belief that God must defend his character before a watching world of righteous created beings somewhere out there in the universe by proving fallen sinners, including Job, can perfectly obey God's 'eternal moral law'. The so called 'eternal moral law' of God is never mentioned or even alluded to. There is no such thing as 'the character of God' since 'character traits' define sinners and not God. God is sovereign. Not even an upright man like Job could challenge God's justice. There is no indication that Job nor his friends ever lived perfect lives. The mention of a sacrifice for atonement of their sins indicates they each knew of their need for a Savior. Sickness or other afflictions are not always the result of personal sin. At times it simply and profoundly displays the mighty works of God, John 9:1-3. While not directly stated, Satan was exposed as a fool.
" “ ‘The secret things belong unto the Lord our God: but those things which are revealed belong unto us and to our children forever.’ Deuteronomy 29:29. Just how God accomplished the work of creation He has never revealed to men; human science cannot search out the secrets of the Most High. His creative power is as incomprehensible as His existence.”—Ellen G. White, Patriarchs and Prophets, p. 113." Deuteronomy chapter twenty-nine is Moses' final warning along with a recounting of the promises God made with the Hebrew people at Mount Horeb, which is known as the Mosaic or Old Covenant. The phrase, 'those things which are revealed belong unto us and to our children forever' refers to a collective total of everything recorded in the first five books of the bible. Certainly the creation account is given at the beginning of Genesis but this is not Moses' theme here in Deuteronomy. In Job 1:8 God himself declares that Job is "blameless and upright, who fears God and turns away from evil". 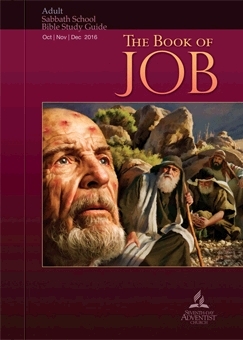 The book of Job begins with the declaration by God that Job is "blameless and upright". Satan is exposed as a fool to assert to the sovereign Creator God of the universe that Job would "curse you to your face", Job 1:11. However the book of Job makes no further direct reference to the foolishness of Satan. What Job, his three friends (Eliphaz, Bildad & Zophar) and even Elihu didn't appear to fully understand, is that foremost above all else, our sovereign God justifies himself before none. Only Elihu limited his thoughts about God to what he understood to be applicable to job's suffering. The prophet Jeremiah, along with the few others who had not bowed the knee to Baal, suffered what was about to happen to the city of Jerusalem while rebellious sinners are repeatedly called to repentance. From within the framework of the New Covenant, know that those who have been declared righteous by God will never be separated from the love of God, Rom. 8:18-39. While the Great Controversy doctrine is totally false because it limits the sovereign will of God who declared his full completed victory over death at Calvary, we do have an enemy. Therefore we are reminded to have on the full armor of God, Eph. 6:10-20 because our adversary the devil is on the prowl. The devil is powerless against the armor of God. This is not about gaining salvation which is founded solely upon Jesus' shed blood at Calvary. This is all about placing our trust in our sovereign God as we live victoriously in this terrible fallen world. “God has permitted a flood of light to be poured upon the world in both science and art; but when professedly scientific men treat upon these subjects from a merely human point of view, they will assuredly come to wrong conclusions." Christians, that is those sins are covered by the shed blood of Jesus Christ and know that the Bible is the inspired wholly true accurate word of God, would tend to agree with what is said in this quote. However "science and art" are not the only ways that those of "the world"..."come to wrong conclusions". As has been shown: Job, who could not answer God's challenging questions, fell down and repented before God who is totally sovereign. This reveals to us that the premise for The Great Controversy to be false because God does not justify himself to those he has created. Furthermore it is unethical to ignore the foundational premise for such a belief. That false premise being that God must justify himself before a watching world of unfallen beings. Ellen G. White, and anyone else, who promotes the book and theory of The Great Controversy is guilty of promoting just as much error as those of the world who are openly rejecting the word of God because of "professedly scientific men". Copyright 2016 BibleStudiesForAdventists.com. All rights reserved. Revised November 29, 2016. This website is published by Life Assurance Ministries, Camp Verde, Arizona, USA, the publisher of Proclamation! Magazine. Contact email: BibleStudiesForAdventists@gmail.com.